According to the University of Rochester Medical Center’s Health Encyclopedia, dumping syndrome occurs in nearly 3 out of 20 people who have had part of their stomach removed. It further states that the treatment of dumping syndrome primarily involves making changes to the gastric bypass diet. 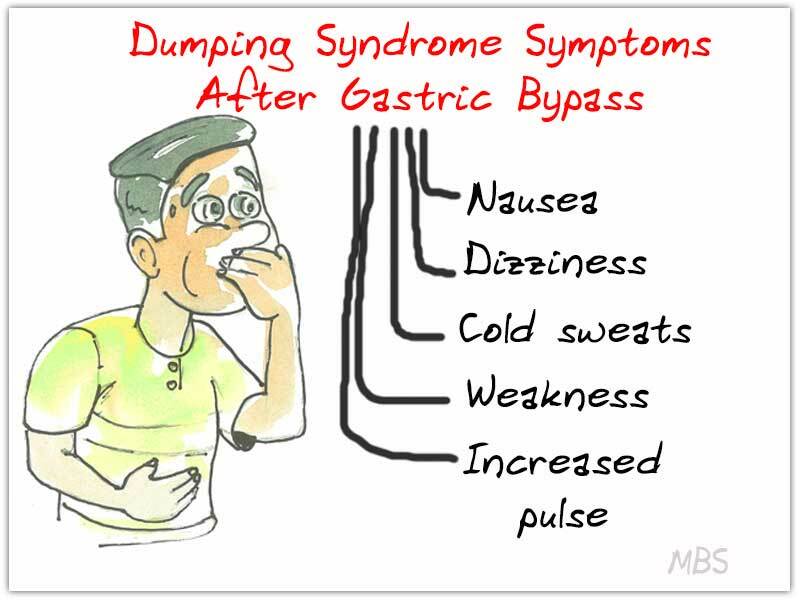 Dumping syndrome after Roux-en-Y gastric bypass (RYGB) occurs when an individual consumes a certain amount of sugar or high carbohydrate foods. This high sugar/carbohydrate food mixture is literally dumped into the jejunum (the second portion of your small intestine) because the pyloric sphincter that connects your stomach to the first portion of your small intestine (duodenum) is bypassed. Because your jejunum is not designed to handle a large load of simple carbohydrates, it brings in extra water to help absorb the mixture. What Not to Eat with Dumping Syndrome? Limit food choices to a total of 25gm of sugar at a meal or less. It is recommended to staying closer to 15gm at a meal for those that are especially sensitive. You do not have to avoid the sugar naturally found in foods like fruit or milk products (milk, yogurt). However, do be cautious of added sugars in sweetened yogurts and chocolate or flavored milk products. Here are some meal and snack ideas that are high in fiber, high in protein, and low in added sugars to help prevent dumping syndrome. 10 mini pretzels and 2tbs. Everyone’s tolerance is different. Obviously, it is better to limit sugar for better weight control and to maximize nutrient intake. Having said that, it is also important to enjoy ALL foods in moderation. It’s just that after surgery and more specifically with the bypass, although some sleeve patients have intolerance issues as well, your threshold for sugar intake is lower due to part of the surgical process. I recommend staying around 10 gm or less of sugar to avoid dumping syndrome. This typically allows for someone to have the equivalent of 1/2-3/4 tsp. sugar in a sitting. Are you experiencing dumping syndrome after bariatric surgery? Tell us in comments!